Yes, yes, yes! This particular topic of the #2014BloggerChallenge is one of my favourite! It's all about the music. I can't even describe how much my life depends on music. I need it when I'm happy, when I'm sad...in every mood. I need it when I travel, when I get ready, when I go to partying, so basically everytime. And in this post I will talk about my loves, my heroes, future-husbands... THE VAMPS :D Yes ladies, I know, not sure if a minute of silence or screaming would be more appropriate now. 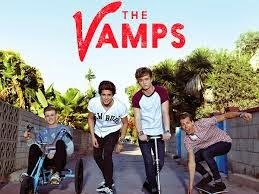 However these adorable boys who made music ( cover videos ) over youtube, now has a whole album that came out! And I have to tell you it is AH-MA-ZING!!! You just need to listen to it. It is kind of indie-rocky-popy, so just great in one! :) And do I have to mention that they're British? ;) Here's their youtube channel.